Bassishaw is a ward in the City of London. 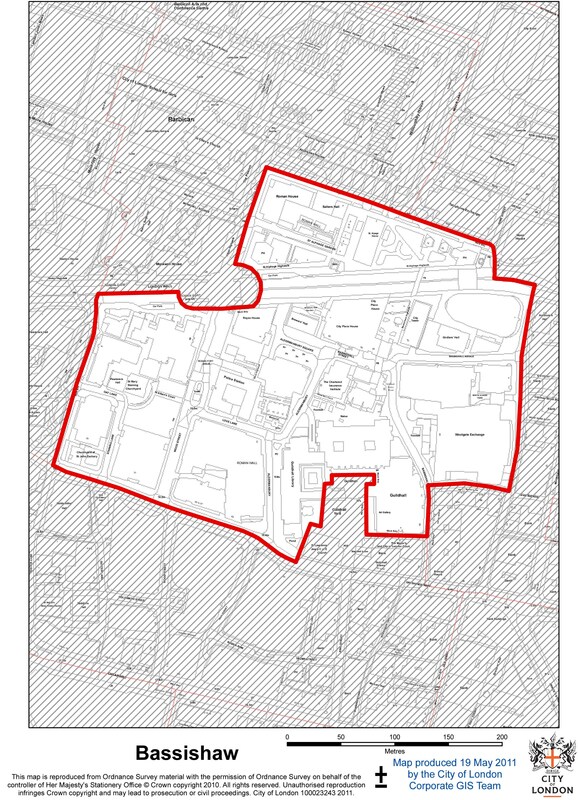 This small ward is bounded on the east by Coleman Street ward, to the south by Cheap ward, to the north by Cripplegate ward, and on the west by Aldersgate ward. Historically, it consisted only of Basinghall Street with the courts and avenues leading from it, but since a boundary review in 2003 (after which the ward expanded into Cripplegate Within) also includes streets further west, including Aldermanbury, Wood Street, and, to the north part of London Wall and St. Alphage Garden. It was historically the City's smallest ward. The ward is named for Basinghall, the mansion house of the Bassing (or Basing) family, who were prominent in the City beginning in the 13th century. King Henry III granted Adam de Basing "certain houses in Aldermanbury and in Milk-street; the advowson of the church at Bassings hall; with other liberties and privileges". John Leake's 1667 map of the City of London refers to the ward as "Basinghall ward". Cole's 1755 map of Bassishaw ward. Located in this ward was a weekly cloth market, authorised by King Richard III. The coopers' guild hall was first founded in this ward in 1522, at The Swan, a public house, and, from 1547, a purpose-built hall accommodated the coopers. Their hall was destroyed in the Great Fire of London in 1666 but later rebuilt on the same site. They rebuilt again in 1865, selling a part of the site to the City of London Corporation for the expansion of the Guildhall. This hall was destroyed by fire on the night of 29 December 1940. The masons' hall was constructed in 1463 in Mason's Avenue, a street which today forms part of the ward's southern boundary. Their hall was also sold to the Corporation in 1865. The weavers and girdlers also had their guild halls in the ward. The modern livery halls of the pewterers, salters and brewers are also located in Bassishaw. There were two churches in this small ward, neither of which remain standing. St. Michael Bassishaw, dedicated to St. Michael, the archangel, which was founded in the 12th century. At that time, the rectorship was included in the gift of St. Bartholomew-the-Great, but, over time, it came to be associated with St. Pauls Cathedral itself. The church was destroyed in the Great Fire of London, and rebuilt in 1679. It was united with St. Lawrence Jewry in 1897; the site was sold in 1899 and the church was demolished in 1900. St. Alphage London Wall, also damaged in the Great Fire but not rebuilt until 1777, was eventually demolished in 1924. The Tower on Wood Street. The ward contains a large part of the Guildhall buildings, the main administrative centre for the City of London Corporation. (A small, but important, part of the Guildhall lies within Cheap ward.) The Guildhall Art Gallery and Guildhall Library both lie in Bassishaw, as part of the Guildhall buildings. The Clockmakers' Museum and Library are located at the Guildhall Library. Also in the ward is Wood Street police station, the headquarters of the City of London Police (which is not to be confused with the Metropolitan Police Service whose headquarters are at Scotland Yard). There is a small police museum at this station. There is also a small museum at the Chartered Insurance Institute at 20 Aldermanbury. 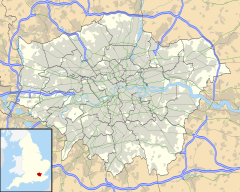 Bassishaw is one of 25 wards in the City of London, each electing an alderman to the Court of Aldermen and commoners (the City equivalent of a councillor) to the Court of Common Council of the City of London Corporation. Only electors who are Freemen of the City of London are eligible to stand for election. Wikimedia Commons has media related to Ward of Bassishaw. This page was last edited on 4 January 2018, at 06:06 (UTC).